Reading the promo sheet I can see that Michael Shanahan has a musical resume that dates back to the 1980s, though I first became aware of him through his participation on the 2011 released Negative Space album by Chester Hawkins’ Blue Sausage Infant project. His first album as Reanimation was Giants Hide Among Us, also from 2011. 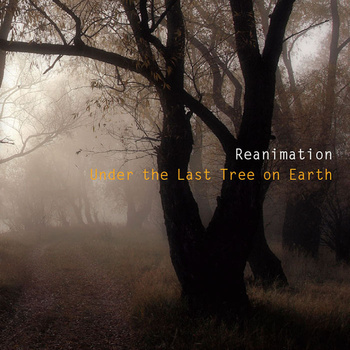 Pat Albertson reviewed that one for AI but I’ve been revisiting it alongside the new Reanimation effort, Under the Last Tree on Earth. The first album is an intriguingly varied set of Space-Prog, Teutonic Kosmiche, somber Psychedelic song, rocking Pop songs, and more. What struck me most is Shanahan’s flair for being accessible… even Pop accessible… while doing so with adventurous music created with interesting instrumentation and arrangements. Under the Last Tree on Earth continues in this spirit. And while Giants Hide Among Us was recorded with some assistance from other musicians, the new album is a genuine solo effort, with Shanahan playing all instruments. Dead Heart Souvenir opens the set and is a deceptively accessible rock song. It’s got a standard beat and catchy melody. But there’s lots going on, including spacey soundscapes and effects, hypnotic flute melody, crunchy guitar blasts, throbbing yet cool grooving bass, and a sense of Psychedelic angst. Abigail’s Ashes Came Home Today begins with an extended introduction of melancholy horn and piano melody, church bells and voice samples. It’s not until nearly the 4 minute mark that the vocals kick off the song portion of what becomes a lightly grooving, and once again melodically catchy Psychedelic rocker. Yet it’s still largely instrumental, and I like how the trippy guitar and tinkling piano contrast yet sound so good together. Surprise Hitchhiker is a high energy Space-Pop rocker with a punky edge. The Space Between Words goes in a different direction, being an ambient and soundscape driven Kosmiche excursion with ethnic percussion and a playfully experimental vibe. After a while it takes on an Amon Düül II improvisational feel, though the guitar is different, corrosively winding a droning, bubbling path through the proceedings. I like the avant-Psychedelic Pop intensity and dervish-like backdrop swirl of And You. Growing With the Growing Light is a spirited Pop rocker that sounds like it could have been a hit in the 80s. Opiate of the Hoi Polloi is a Space-Pop instrumental with noise-drone guitar, freaky alien synths, and intermittent samples from a religious TV/radio ad. The Serpent Fire (Everything Fades) consists of cosmic, jazzy, psychedelic, dreamy yet intense Prog-Pop. And She Never Sleeps is a powerhouse yet acoustically subtle and dissonant rocker, in some ways bringing to mind a modern Velvet Underground. Both Reanimation albums have lots of variety and I can imagine some listeners feeling Shanahan could stand to tighten his focus a bit. Fair enough I say. Regardless, he nails every track. I don’t remember the last time I heard music that is so accessible yet challenging. I probably used the term “Pop” more than any review in recent memory. And yet the spacey, Psychedelic, and Progressive Rock elements abound. If you’ve made it this far and are intrigued, then get ye forth to the Reanimation Bandcamp site where you can get instant gratification and hear for yourself.